Most period properties were built in an era before electric lighting and appliances were standard in homes and as such simply weren't designed to accommodate modern electrical requirements. This makes old wiring and fittings a cause for concern as not only are they unable to meet the demands of modern lifestyles, but they are a potential safety hazard that can result in fires or electric shocks. While it's essential to work alongside an electrician when it comes to wiring or rewiring, our guide to electrics in old homes is perfect if you're looking to get your head around what needs to be done. 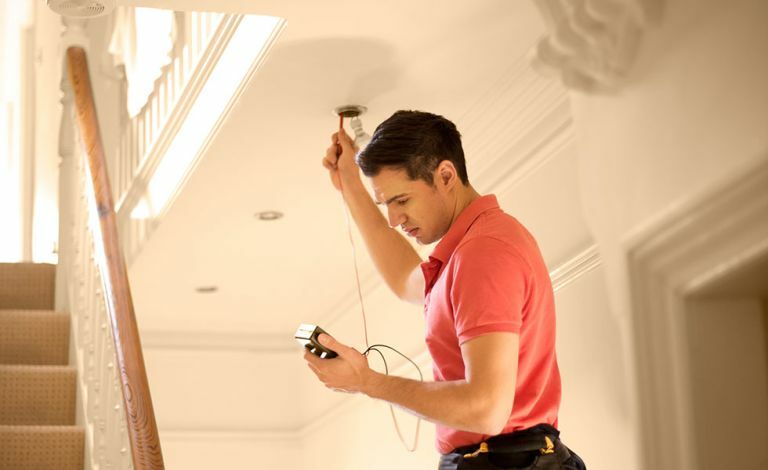 If you're tackling the electrics as part of a larger project, our guide to how to renovate a house is full of expert advice. Do I need to rewire my home? If your house has not been rewired within the last 25 to 30 years, then it will likely need rewiring at least in part. If you are unsure, don’t take any chances – call in a competent electrician to check. To ensure everything stays working as it should, it’s good practice to have electrics professionally inspected every 10 years. On completion of this, the electrician will produce an EICR (electrical installation condition report). An old-fashioned fuse box (now known as the consumer unit). This may have wooden back, cast iron switches, white ceramic fuses, or a mixture of fuses. Surface-mounted cables running along skirting boards and up walls looks unsightly and suggests minimal quick-fix rewire work has taken place. However, sometimes it is used to prevent damage to the building’s fabric. Black rubber, lead or fabric covered cables – modern cabling is uPVC coated. Old-fashioned sockets and Bakelite switches. Although, sometimes these are retained in a non-working condition, or new replica designs may have been fitted. A mix of different socket and switch styles indicate that a partial rewire has taken place. The average cost for rewiring a three-bed semi in the UK is £3,500, but this will vary depending on where you live. If the house is bigger, the job is more complex or there are accessibility issues, the price of electrics will rise accordingly. Sometimes a full rewire can be avoided. If the cabling is sound and able to carry any additional loads, it may be possible to upgrade it by adding a modern consumer unit, proper earthing arrangements and cross bonding. What DIY electrics can I do? Any new electrics work must comply with the current building regulations, and a certificate must be issued on completion. For more information, visit Electrical Safety First. It’s important to create an electrical plan before the work begins, so you know exactly where you need lights and sockets. Additions mid-way through are costly and if you miss out a useful power point, you will regret it later on. Using a plan of the house, mark the position of your furniture, then add the location of light fittings, power sockets and switches plus other electrical points. Think about including extras like under-cabinet and bedside lighting. Always include more sockets than you think will be needed and remember to include supplies to boilers and fixed appliances. Once the work is finished, draw plans showing cable routes wherever the new electrical work has been carried out. This will prevent the wiring being accidentally affected in future. Unfortunately fitting new cabling and sockets is disruptive to a home’s fabric, so try to have electrics work carried out at the early stages of renovating or refurbishing, and at the same time as any central heating or plumbing alterations. It’s best if you can move out when the work is taking place. The best way to approach electrical work in old properties is to consign as much as possible of the installation out of view in nonsensitive areas (ancillary rooms or voids such as floor cavities) to minimise its physical and visual impact. Plasterwork will be affected, so ensure the re-plastering work is in keeping with the house’s character; look to breathable lime plaster finishes. Old floorboards will need to be carefully lifted — it’s a good idea to fix them back down with screws, rather than nails, for future access. If your home was built using vernacular materials, such as oak frame, cob or solid stonework, make sure you hire an electrician with experience of such buildings. Try to avoid running cables in the roof space. Where this is unavoidable, lay them above, rather than underneath, any insulation materials to prevent them overheating. Do try to ensure external fixings for cables or lamps are made into the mortar rather than the face of bricks or stones. These cannot easily be repaired, whereas mortar may be patched successfully in the future. Although electricity was first used to light homes in around 1880, it was not until after World War I that it replaced gas as the main source of illumination. The incandescent light bulb reigned supreme until comparatively recently but, as these lamps only convert 10 per cent of the energy they consume into light, they are now being replaced by far more energy efficient alternatives. When positioning lights, think carefully about the risk of fire and the damage that may be caused by their installation. For example, recessed downlights can weaken fragile ceilings, compromise the fire protection the ceiling offers and allow air leakage, draughts and the passage of moisture. Always ensure that downlights are fire rated and that insulation is not placed close to them. Which bulb type is best? When choosing modern lighting sources for older buildings, consider the quality and colour temperature of light they offer. Traditional incandescent bulbs (lamps) provide a spectrum of light not dissimilar to fire or candlelight, so they tend to feel more natural in historic interiors than some modern alternatives. LED (light-emitting diode) lamps are generally the best way of replacing incandescent lighting, as they use very little power and are capable of producing high quality light. These are available in various colour temperatures, and a number of specialist LED lamps have now been developed specifically for historic interiors and fittings to mimic the appearance of a traditional filament. Alongside internet and entertainment setups, smart technology systems that allow the home to be monitored and operated remotely from a computer or mobile phone, are now becoming affordable. Although wireless systems have the advantage of avoiding cables, hard-wired systems are sometimes favoured in period houses as the thickness of walls, chimney breasts, steelwork and even foil-faced insulation materials may interfere with signals, including wi-fi internet. For this reason additional wi-fi transmitters may be needed. Our guide to the best smart home tech for your house is a handy read if you like the idea of smart home solutions, but don't know where to start. Looking for more renovations advice and inspiration?